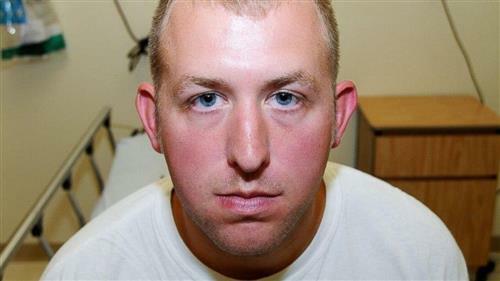 Officer Darren Wilson not indicted by grand jury in death of Michael Brown. Missouri Gov. Jay Nixon pleaded for calm tonight just hours ahead of the state prosecutor's announcement of whether or not Officer Darren Wilson will be indicted in the shooting death of unarmed teenager Michael Brown. A press conference is scheduled for 9pm ET. "Our shared hope and expectation is that regardless of the decision, people on all sides show tolerance, mutual respect and restraint," the governor said. Stuffed animals, flowers and other memorials mark the site of where Michael Brown was shot to death in August. 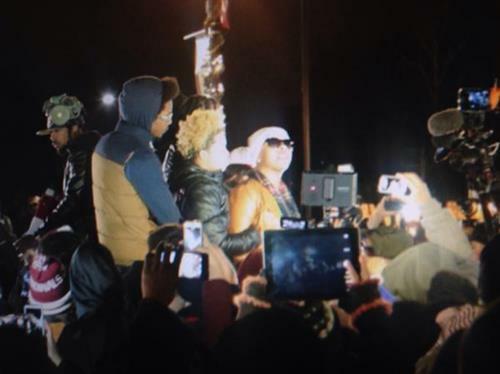 ABC News producer Micah Grimes filed this account of the emotional scene earlier today. 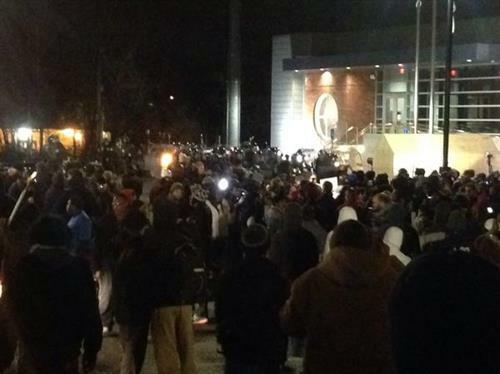 A crowd is gathering outside the Ferguson police station ahead of the press conference tonight at 9pm ET, where we're expected to learn whether or not Officer Darren Wilson will be indicted in the shooting death of unarmed teen Michael Brown. ABC News is live streaming from the crowd here. McCulloch: some witnesses say Wilson fired as #MichaelBrown was running away. Others say he wasn't firing until Brown turned around. We are profoundly disappointed that the killer of our child will not face the consequence of his actions. Let's not just make noise, let's make a difference. Michael Brown's parents will speak at a press conference tomorrow at 12 pm ET at the Greater St. Mark Missionary Baptist Church in St. Louis. 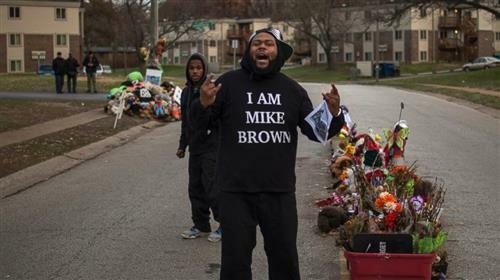 "The whole world is watching how we respond, how we react," McCulloch says. 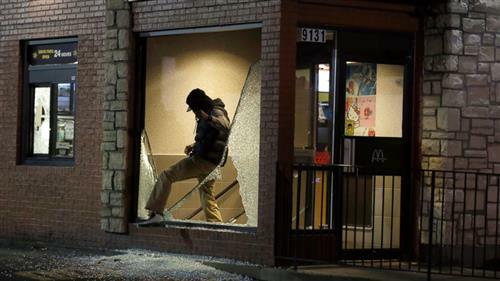 Windows of some local businesses appear to have been smashed, St. Louis Police tweeted they are responding to reports of looting on S. Florrissant, located just south of the Ferguson Police Department. A woman's voice can be heard on the live stream saying, "We're not doing this right now...You're better than that...We've worked too hard." Various items appear to have been set on fire, including a car and a bike, as the clashes continue into the night. 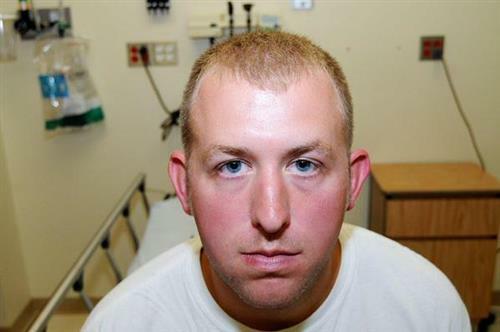 ABC News story coming soon: We're learning Officer Darren Wilson's account for the first time of why he fired on Michael Brown. "I was guaranteed he was going to shoot me. That’s what I thought his-his goal was. He had already manipulated I was not in control of the gun. I was able to tilt myself a little bit and push it down and away towards the side of my hip," Wilson said in an interview with detectives, according to court documents. 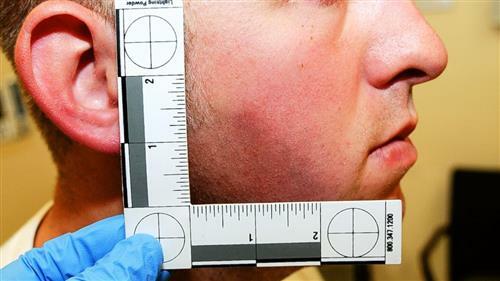 A profile view of Wilson's face is seen in this photo released by the St. Louis County Prosecutor's Office. 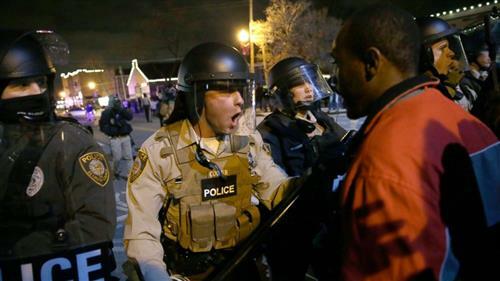 The St. Louis County Police Department just tweeted that tear gas was used around 9:15 pm CT on South Florissant "after smoke was unsuccessful in dispersing violent crowd. Smoke was used FIRST." Storage facility and Sams Meat Market near W. Florissant and Canfield set on fire by looters. #Ferguson. St. Louis Co. Police: Storage facility and Sam's Meat Market near W. Florissant and Canfield have been set on fire in #Ferguson . 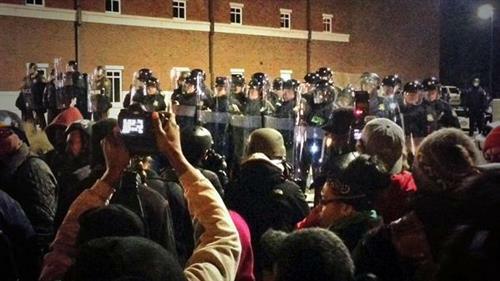 The FAA has issued instituted no-fly-zone over Ferguson. As the protests continue into the night, there are also other groups around the country who have assembled to protest the grand jury’s decision. In Washington D.C., ABC News’ Devin Dwyer reports that several hundred people – many of whom appear to be college students – have gathered on Pennsylvania Avenue along north fence line in a peaceful but boisterous protest. In New York, an estimated 200 people gathered at Union Square and then marched uptown to Times Square. 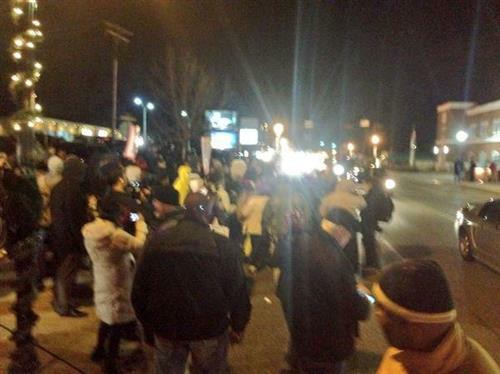 In Philadelphia, ABC News’ owned station WPVI reports several hundred people marched along Market Street in downtown. 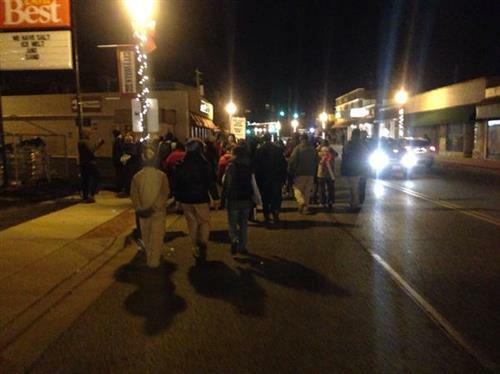 In Chicago, ABC News’ owned station WLS reports that an estimated 200 protesters peacefully marched through the streets. In Los Angeles, a small demonstration of an estimated 100 people marched downtown on Martin Luther King Blvd. In Oakland, California, a few hundred people marched down the street carrying banners. The protestors then reportedly moved onto the I-580 westbound freeway. In Seattle, less than a dozen people marched through downtown and Westlake Park, according to ABC News' Seattle affiliate KOMO. Here's the full set of images released by the St. Louis County Prosecutor's Office of Officer Darren Wilson, along with an image of the weapon used in the fatal shooting. We're wrapping up coverage on our live blog. Continue following the story on ABCNews.com as it develops throughout the night.